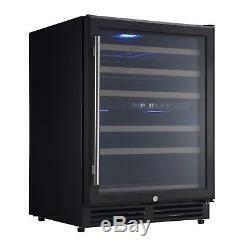 ElectriQ 60cm Wide 51 Bottle Dual Zone Wine Cooler - Black EQWINE60BL. Serious about a good vintage? If you're a wine enthusiast you'll know how import it is to store your prized bottles in optimal conditions. The electriQ wine cooler makes maintaining your bottles simple, easily storing up to 51 average 750cl bottles, giving prime temperature conditions to both white and red. The cooler is not only practical but makes for a great focal point when you're entertaining. Store your wine in style. Modern elegance, the electriQ wine cooler has a stylish black exterior, fitting into your kitchen beautifully. Featuring premium solid wooden shelves and a sleek, smoked glass door. A soft blue interior light will showcase your collection whilst digital touch controls with a clear white LED backlight make the cooler easy to control. Install the cooler under your counter or free-standing, with a reversible door and adjustable feet installation has been made easier. The wine cooler is unbranded giving it a clean finish that will coordinate effortlessly with your existing appliances. Boasting of an outstanding 150L capacity this electriQ wine cooler can hold more than just your favourites, storing up to 51 average sized 750cl bottles. 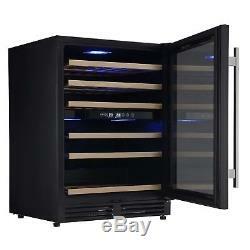 This quality wine cooler from electriQ holds 5 full and 1 half solid wooden shelves. The shelves can be slid out, enabling you to take a closer look at the bottle you're selecting. This wine cooler has dual temperature storage zones. Perfect for those who enjoy both white and red wines, as this cooler has a section dedicated to each. The upper section of the wine cooler is perfect for white wines, with a temperature range of 5-12°C. The lower section ranges from 12-22°C, ideal for reds. Investing in the electriQ wine cooler will give you peace of mind that your bottles will be stored in prime condition. The cooler has humidity control, meaning the corks and labels of the bottles won't dry out, and with good ventilation a damp atmosphere and mould are prevented. When opened the cooler can easily recover its interior temperature quickly as it has fan cooling, and with a charcoal filter your wines are protected from contamination. Wine constantly develops and reacts to its surroundings. The electriQ wine cooler features a double glazed, toughened, smoked and UV protected glass door. This premium door design ensures your collection is well insulated and protected from the damages sunlight can incur. With a lock and key you can physically protect your wine collection. Ideal for protection against curious little handles and protecting your Veuve Clicquot from pilfering guests. DIMENSIONS: W59.5 x D57.5 x H82 cm. 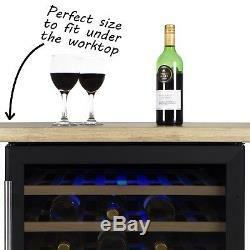 Holds up to 51 bottles - 75cl standard wine bottles. Store white wine at the top & red wine at the bottom. If storing champagne a shelf at the top will need to be removed to accommodate the bottle shape & size. Quality wooden sliding shelves - 5 Full shelves & 1 half shelf. Double glazed, toughened glass door to insulate your collection. Smoked, UV protected glass door, protecting wine from the effects of sunlight. Soft blue LED lighting, showcasing your vintages beautifully. Lock and key to keep your vintages safe. 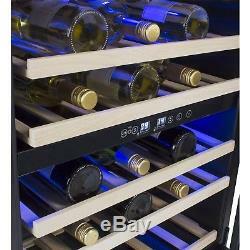 Dual temperature storage zones, ideal for red & white wine storage. Easy to use digital touch controls. Compressor driven, delivers powerful cooling & maintains a stable temperature. Humidifier ventilates air, providing optimum storage conditions. Active charcoal filter prevents wine contamination. Adjustable feet (75mm) for the perfect fit. Rear panel material - pre-coated metal back. Reversible door for easier installation. Noise level - 40-42dB won't disturb your household. 26 customers have bought and rated this product, giving it an average score of. Our success has been achieved though purchasing at highly competitive prices and passing the savings directly on to the customer. We'll take a look at your order and make sure that the products you have chosen are suitably matched. If we have any special offers or alternatives that we think might be a better suited, we'll get in touch to let you know and discuss the options over with you. If you'd like to pay by card, please have your e-bay user ID and item number ready and call 01484 448 969 with your card details. Nearly all orders arrive on time and in good condition but occasionally goods can get lost or damaged in transit, we do our best to prevent this by working the the highest quality couriers. 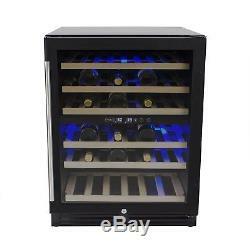 The item "ElectriQ 60cm Wide 51 Bottle Dual Zone Wine Cooler Black EQWINE60BL" is in sale since Tuesday, January 3, 2017.